If you own a home, chances are that you haven’t thought about termite pest control very much since the initial inspections upon purchase of the home. Most homeowners don’t think about termites until they see the signs of a possible infestation, and often not until it’s too late to avoid serious damage. An unchecked infestation of termites or other pests can result in structural damage and unsafe living conditions for kids, grownups, and pets alike. 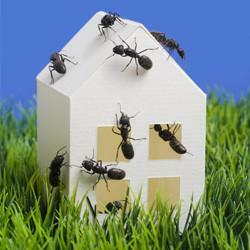 Termite and pest control are serious business for homeowners and should not be taken lightly. Knowledge is the first step. So, if you want to keep your home free of termites, here are eight facts you need to know. 1. There are Two Species of Termite Found in the U.S.
Termites might form different types of colonies depending on whether they are Drywood or Subterranean termites. The Subterranean species, which is found everywhere in the U.S. besides Alaska, forms colonies underground including thousands of workers and prefers to eat soft wood fiber found in sunnier climates. The Drywood species prefers dry wood (as the name implies), can form several colonies in one home, and does not need to live in the soil to survive. If you have spotted winged termites in your home, you can bet that the wood is already seriously infested with termites. They form wings when they’re ready to leave the colony, breed, and start colonies of their own. If you’ve found wood damage accompanies by sawdust piles, you may be suffering from some sort of infestation, but it isn’t termites. A colony of termites would want to eat as much wood as possible, so you would be more likely to find a series of hollow tunnels with traces of dirt. Mud tubes around the floor joists, foundation, piers, and sills of a home may also be sign of a termite infestation. Termites often build these tubes to live, hide, and travel in. While there are many ways to spot a termite infestation, sometimes the damage can continue unnoticed for a very long time. Termites can tunnel within the interior of the wood without hitting the surface and revealing themselves. This is why inspections are encouraged. It takes months for termites to do serious damage, but once it’s done it’s done. Since termites work so slowly, though, it pays to take the time to find the right company that you can trust with your residential termite control. Temecula homeowners are fortunate to have Black Knight Termite & Pest Control, a locally owned and operated company with an excellent reputation that they can trust in. There is no such thing as a one-size-fits-all treatment for termite control. Some homeowners prefer natural termite control options, for example. There are also different treatments depending on whether Subterranean or Drywood termites have infested the home, including drill-and-injections, foam injections, trench-and-treatments, whole house fumigations, thermal heat, localized treatment, and foam treatment. To learn more about your termite control options, contact Black Knight Termite & Pest Control today.